I’d been looking at more unique ways to save money with online purchases lately when I stumbled upon an interesting concept that Amazon has been promoting: subscription-based purchases. Turns out, this is nothing really new and something that Amazon’s been doing for awhile. According to resident thrift-expert – Charlie – their family regularly purchases items like toilet paper, granola bars, paper towels, dishwasher detergent and diapers through subscription. Now I normally would hesitate at purchasing anything on subscription. I simply like the least amount of recurring expenses as possible. But, we all have these purchases we need to make on a regular basis – be it weekly, monthly or 2x a year (a la water filters). So, if you can save while you purchase them (time and again) – I say, “I’m in!”. There are obvious different schools of thoughts on these guys. Some say you can use the filter much longer than the 6-month period the refrigerator “times” them out at. But for the sake of argument – let’s go by the manufacturer’s suggestion – which is about the half-year period (based on normal water usage). Now, I may be committing thrifty heresy here by admitting to this – but I routinely purchase my refrigerator filters off the shelf at hardware stores (like Home Depot or Menards) at – most likely – a premium price of $45/each. I realize there are filters out there for much less, but my wife and I appreciate the ones that take out as much of the crap as possible. As an example, I’m going to use the Whirlpool KitchenAid PUR Push Button Cyst-Reducing, Side-by-Side Refrigerator Water Filter (as shown). This guy is a real-fighter. He will reduce cysts, mercury and lead all the while taking out chlorine and other impurities. So, like I mentioned, I’ve typically paid about $40 one of these at Home Depot and not thought much about it (chalking it up as a 2x a year expense). So, enter Amazon’s initiative to get us to order all our recurring purchases through their aptly named, “Subscribe and Save ” program. Nothing real scientific about it – you scan through some of the things you regularly purchase, and see if Amazon carries them in their subscription program, and then sign up to receive these items on a pre-determined schedule. When you do – you can save as much 15% on certain items. So, as I was looking through the products they offered through the program, I came upon my cyst-reducing, chlorine-fighting, kyptonite-blocking filter and I was a bit surprised to see it at $30. All this time – I had been lazily purchasing an item I could have been saving $10 or more! To top it off, I went ahead and put it on a 5-month subscription and saved another 15% off the purchase price! How about them apples? (er, water filters). Turns out the more subscriptions (items you receive in a month) – the more you can save (ie, 1-4 subscriptions: 5% savings; 5 or more: 15% savings). So, we’ll see if I can get even more things added to the program. Subscription purchasing the wave of the future? Can you imagine all the times you go to the store to purchase those one/two-off items – and the time you could be saving by just putting these things on subscription? I think it’s always important to factor in the time and means of doing things – so this clearly could be a new way of buying recurring items. I’d be interested to know: if you buy things on subscription at Amazon or other online retailers? What items – and how much do you generally save? 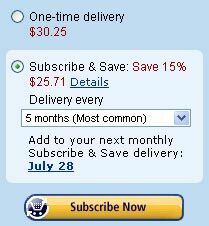 Try Amazon’s Subscribe and Save Service! This would work for some things but not others. For example, the large rolls of Bounty paper towels, that we go through quickly, are 5 dollars cheaper at the Sam’s club we frequent. But tracking items on various sites is definitely a good idea so as to score that discount that pops up! @Lesley – you’re right, not great for everything – but for some staples.